Just a quick note to say a Merry Christmas / Season’s Greetings to everyone out there! I’ve really enjoyed starting my blog in 2008, and I’m looking forward to continuing/evolving it in the year to come. I’ll be another year older by then (New Years Eve birthday boy!) so look out for a more mature approach in 2009! 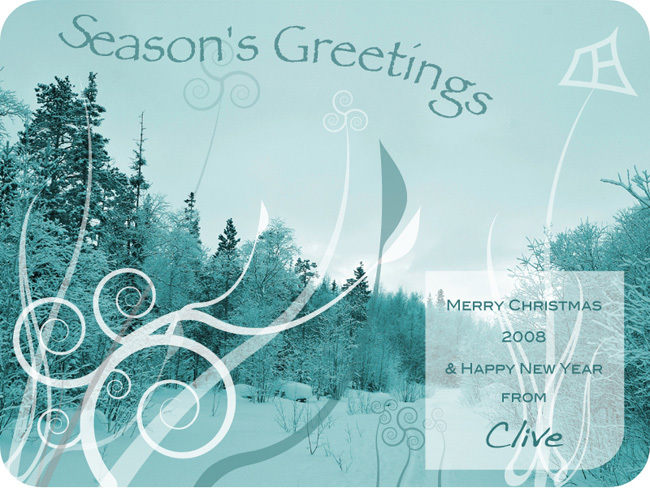 Thanks to everyone who’s read, commented and emailed me this year – Happy Christmas to you all! PS: I’ve had some very interesting responses to Clivey’s ‘Copper Creation’ Christmas Competition, but no one has got it right as yet! I’ll keep it open until 31st December, in case anyone gets any post-turkey inspiration!? Clivey’s ‘Copper Creation’ Christmas Competition. . . In the joyous spirit of Christmas this year (Bah, Humbug!) and because I’ve just built a new little copper tube-based widget, I thought I’d run a little competition for all you bloggers out there. If anyone can tell me what my newest creation is (as seen in the photo below), I’ll give away a specially reproduced version to the winner. what can it be. . ? A small clue to help you on your way – it’s involved with something musical. . . The pen is just there to show the size/scale by the way, and has nothing to do with the actual device itself! Please send me your ideas as comments or emails, and I’ll post up the first winning entry in the new year. I’ll also post any particularly weird, inventive or downright surprising entries as they come in, just to maintain and heighten the level of suspense and wonder!